Build simple, four-step buy and sell algorithms on any equity, interest rate, forex or commodity product. Back-test your ideas, run them live or auto-execute them directly to your brokerage account. 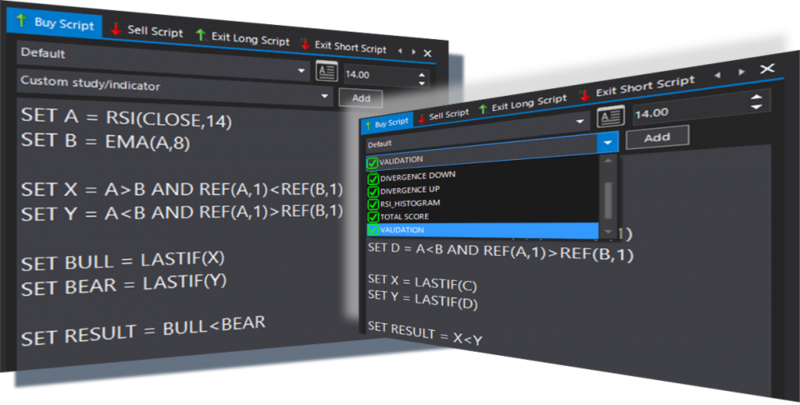 Scripted alerts are simple, four-step (buy / sell / exit long / exit short) algorithms used to trade single instruments such as individual stocks, futures or currency pairs. Because fulfillment of the algorithms lead to clearcut buy or sell signals that require action be taken , the algos would normally be written like validation custom studies – a buy or sell signal is either triggered or it isn’t. The difference here is that the algos employed on any leg of a scripted alert will only have a RESULT function and will simply skip the REVERSE_RESULT inverse function. 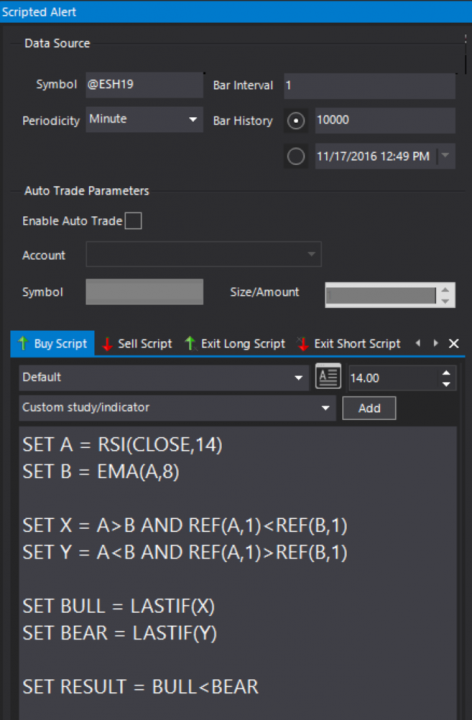 You can type your buy / sell / exit long / exit short scripts in the appropriate sections or, easier yet, you can “call the code in” from inside any editor-based or wizard-based custom study.